Register for the ABPI R&D Conference 2015 and come and browse our drug discovery books at the RSC booth. The ABPI have a host of senior speakers confirmed from within the biopharmaceutical industry and across the breadth of the UK life sciences community. As a specialist publisher, working with internationally respected authors, we’re consistently able to make the best chemical science knowledge accessible to everyone, encouraging new ideas and inspiring scientists of the future. And there’s a lot to look forward to in 2016. 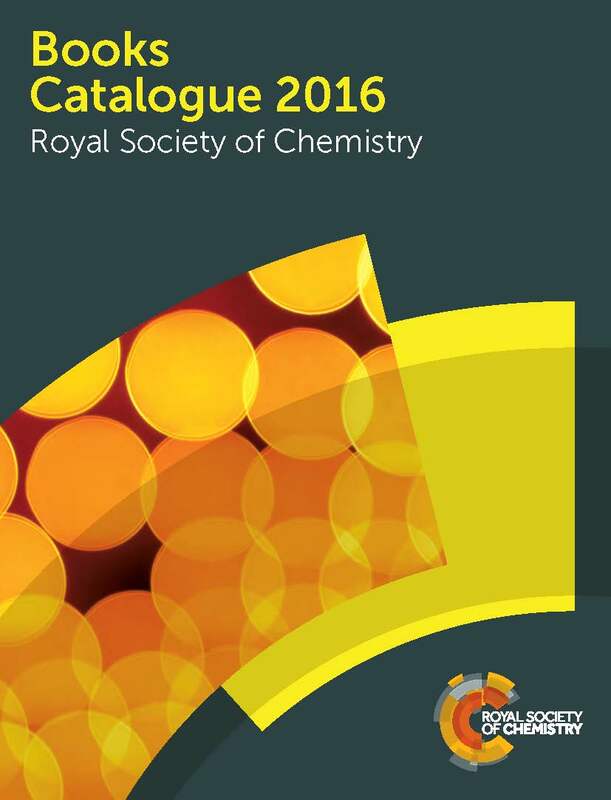 Explore the new RSC Chemical Biology Series, find out what we’re adding to the Green Chemistry, Drug Discovery and Issues in Toxicology series, and view the latest popular science titles in the Books Catalogue 2016. Request free inspection copies of student-friendly textbooks, full of subject-specific information, and find out more about new editions such as Food: The Chemistry of its Components 6th edition in our Textbook and course materials catalogue. Browse textbooks, series volumes and reference titles including our acclaimed Drug Discovery Series, or order McCance & Widdowson’s The Composition of Foods (7th summary edition) and Molecular Biology and Biotechnology 6th edition through the Life Sciences books catalogue. Developed to provide a broad choice of highly relevant content, we now have more than 1,500 print and over 1,300 eBooks to choose from in our portfolio. This includes additions to current Series, new editions of classic textbooks and some great new titles that put chemistry into the context of daily life. From cutting-edge reference works to proceedings of our popular Faraday Discussions, our print books are available as series, subject sets and individual titles. Available by year or subject, and divided into 11 key areas from analytical to physical chemistry, our eBook Collection includes professional reference titles, specialist periodical reports and special publications. If you’re looking for something a little more flexible, this model allows you to choose a package to suit your library from the eBook Collection. With a minimum spend of £1,000, it’s ideal for smaller institutions. For more information about our portfolio, please get in touch. Print copies of our Books Catalogue are also available – please contact us with your mailing address if you would like one. 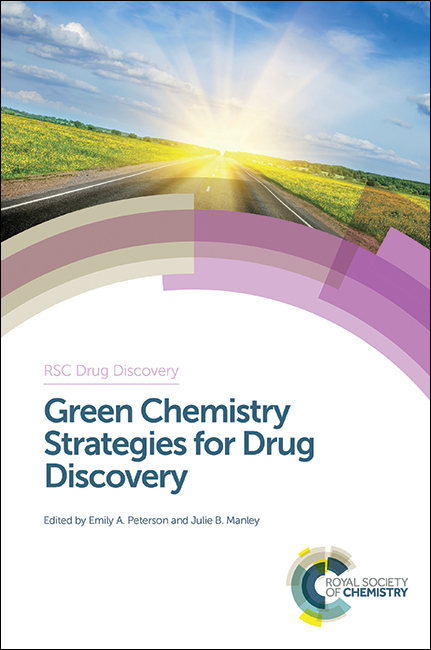 New publication in the RSC Drug Discovery series: Green Chemistry Strategies for Drug Discovery, edited by Emily A. Peterson and Julie B. Manley. It is rapidly becoming clear that by incorporating green chemistry techniques earlier in drug development, pharmaceutical companies can greatly speed up the production of potential drugs.Integrating green chemistry protocol into the drug discovery discipline is a relatively new phenomenon, as the scale at which chemists operate in drug discovery is smaller than those used in process and manufacturing chemistry. Green Chemistry Strategies for Drug Discovery is written by pioneering experts in green chemistry. It provides a practical guide illustrating, to both academic and industrial labs, how to implement greener approaches for the greatest return on their investment, and without slowing down their science. The editors, Emily A. Peterson and Julie B. Manley, have taken a comprehensive approach to this emerging field, covering the entire drug discovery process from molecule conception, through synthesis, formulation and toxicology with specific examples and case studies where green chemistry strategies have been implemented. They also address cutting-edge topics like biologics discovery, continuous processing and intellectual property. Green Chemistry Strategies for Drug Discovery is the newest publication in the RSC Drug Discovery series. Further details on the content and scope of this book can be found on its Books Publishing page. If you like what you read, Green Chemistry Strategies for Drug Discovery is available now as a hardback from our Royal Society of Chemistry Bookshop. It is also in our 2015 eBook collection. 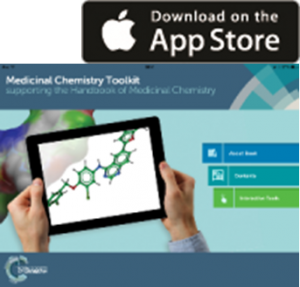 The Medicinal Chemistry Toolkit App, compatible with iOS devices and optimised for iPad, provides a suite of resources to support the day to day work of a medicinal chemist. Exciting new functionality recently released in v2.0 allows you to draw your own structures and provides direct feedback on the quality or drug-like nature of your compound and calculates pharmacologically relevant properties (GClogP, ligand efficiency). 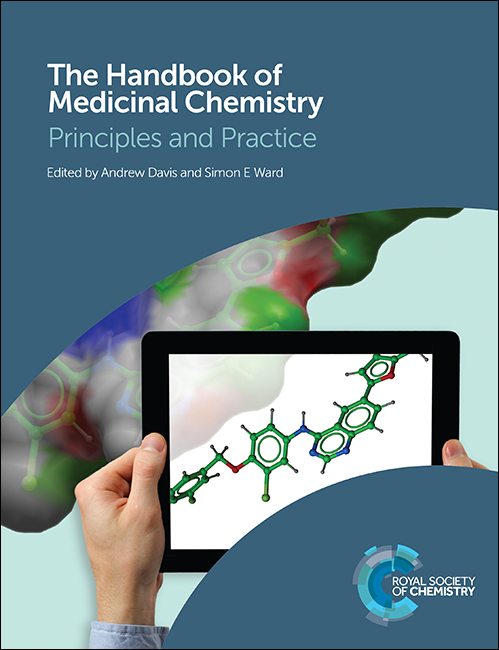 The app has been designed in collaboration with the editors of The Handbook of Medicinal Chemistry: Principles and Practice, which was published in December 2014 providing a comprehensive, everyday resource for a practicing medicinal chemist throughout the drug development process. Price: £84.99 – RSC Members receive 35% discount! Comprehensive and up-to-date information covering the entire drug development process. Written and edited by experts from academia and industry. Case studies with hints and tips from within the industry allow medicinal chemists to apply academic understanding to drug discovery. The Handbook will be published online to allow greater linking to relevant resources. Per chapter download from our publication platform containing additional features, such as links to protein and chemical structures, interactive graphs and downloadable project management templates, will be available soon. Take a look at these recently published books on solar energy in our Energy and Environment Series by clicking on the links below. You can access the front matter, table of contents and the first chapter of these eBooks for free. 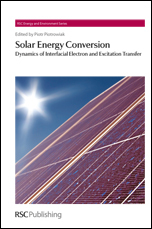 This book provides a state-of-the art review on the experimental and theoretical approaches of studying interfacial electron and excitation transfer processes which are crucial to solar energy conversion. The presented approach is fundamental in nature and thus applicable to a broad range of hybrid photovoltaic and photocatalytic materials and interfaces. The book focuses on the dynamic aspects of the electron injection, exciton and carrier relaxation processes, as well as coherence effects, which continue to provide the impetus and the greatest challenge for the development of new methodologies. Edited and written by leading experts in the field, “Solar Energy Conversion” will appeal to those working on the fundamentals of hybrid photovoltaic and photocatalytic materials, as well as those commercially interested in their applications. This book provides an authoritative reference on the various aspects of materials science that will impact the next generation of photovoltaic module technology. The emphasis of the book is on thin film photovoltaic materials, addressing the fundamental aspects of photovoltaic solar cell materials and giving a comprehensive description of each, either in research or in production. Particular attention is given to the key materials drivers of solar conversion efficiency, long term stability, materials costs and materials sustainability. The book is essential reading for materials scientists, energy technologists and all those involved in solid-state physics. This book presents the latest developments in photovoltaics which seek to either reach or surpass the Shockley-Queisser limit, and to lower the cell cost per unit area. Progress toward this ultimate goal is presented for the three generations of photovoltaic cells. The first generation is based on crystalline silicon semiconductors. The second generation is based on thin film silicon, compound semiconductors, amorphous silicon and various mesoscopic structures. The third generation is based on the unique properties of nanoscale materials, new inorganic and organic photoconversion materials, highly efficient multi-junction cells and novel photovoltaic processes. The extent to which photovoltaic materials and processes can meet the expectations of efficient and cost effective solar energy conversion to electricity is discussed. Written by an international team of expert contributors, and with researchers in academia, national research laboratories, and industry in mind, this book is a comprehensive guide to recent progress in photovoltaics and essential for any library or laboratory in the field. Take a look at these recently published Materials Science books covering topics across a number of our portfolio series by clicking on the links below. You can access the front matter, table of contents and the first chapter of these eBooks for free. 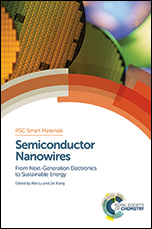 This book provides a timely reference on semiconductor nanowires including an introduction to their synthesis and properties. Chapters focus on the different applications including photovoltaics, nanogenerators, transistors, biosensors and photonics. Edited by leading experts in the field and with contributions from well-known scientists, the book will appeal to both those working on fundamental nanomaterial research and those commercially interested in their applications. 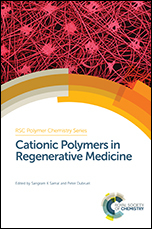 This book brings together the expertise of leading experts in the field to provide a comprehensive overview of the recent advances in cationic polymer synthesis, modification and the design of biomaterials with different structures for therapeutic applications. Applications discussed in the book include drug and gene delivery, therapeutics in thrombosis and inflammation as well as gene therapy. Suitable both for an educational perspective for those new to the field and those already active in the field, the book will appeal for postgraduates and researchers. The broad aspects of the topics covered are suitable for polymer chemists interested in the fundamentals of the materials systems as well as pharmaceutical chemists, bioengineering and medical professionals interested in their applications. In many cases of colloidal particles at interfaces, the mechanism of particle interactions is still unknown. 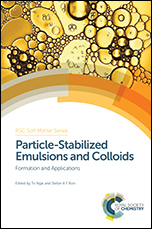 This book introduces the basic concepts and principles of colloidal particles at liquid-liquid interfaces, discusses the latest advances in emulsions stabilized by solid and soft particles and covers applications in food science and oil extraction. 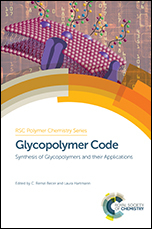 With contributions from leading researchers in the field, the book is a unique source for graduates and academics new to the subject and already working in the area of glycopolymers. Lab-on-a-chip devices for point of care diagnostics have been present in clinics for several years now. Alongside their continual development, research is underway to bring the organs and tissue on-a-chip to the patient, amongst other medical applications of microfluidics. 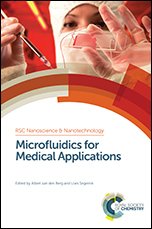 This book provides the reader with a comprehensive review of the latest developments in the application of microfluidics to medicine. Written with students and practitioners in mind, and with contributions from the leaders in the field across the globe, this book provides a complete digest of the state-of-the-art in microfluidics medical devices and will provide a handy resource for any laboratory or clinic involved in the development or application of such devices. This one-day meeting, co-organised by the Royal Society of Chemistry journal Soft Matter and the Durham Centre for Soft Matter, Durham University, UK, will mark the 10th anniversary of the launch of Soft Matter. For more information, please click here. Our new, streamlined online Bookshop will very soon go live! Its many novel features make browsing our vast collection of print and eBooks much easier and faster, allowing you to stay up to date with the most recent cutting-edge discoveries and developments in the chemical sciences. The Bookshop homepage showcases our selected new publications, forthcoming publications and highlights, with their prices and cover images, to save you time if you’re looking for a specific item. Should you be in the mood to browse and don’t have a particular book in mind already, you can search through both our published and forthcoming books, accumulating filters to pinpoint exactly the topics you are interested in. We also have a counter which ticks over with every filter that you add, to show how many books are available with your search terms. Are you a Bookseller or Author? The Bookshop has tabs packed with useful information relevant to you regarding catalogues, E-Alerts, promotional material, publishing guidelines and recent reviews. If you’re stuck for present ideas, the Bookshop also contains a whole tab dedicated to Gift suggestions. Our Add to Basket and Checkout procedures are much more straightforward, so you can buy what you want when you want. Perfect for our busy clients. You can also pre-order forthcoming books to ensure you don’t miss out on the most popular titles. So keep an eye out for our fresh new page. We hope you enjoy your shopping experience with us. The first Zing Computational Chemical Biology conference will take place from the 6th to the 9th of August 2015. 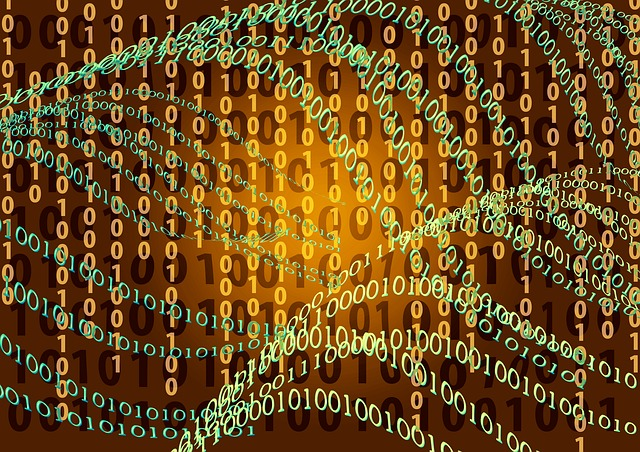 It will bring together scientists to discuss multidisciplinary research that leverages computer simulation to address key questions crossing the physical sciences-life sciences/biomedical interface. In particular, the conference will feature sessions focusing on the development and application of novel and state-of-the-art computational tools and technology for solving major problems in the life and biomedical sciences. Topics will include advances in molecular dynamics simulation of enzymes; computational approaches to studying the interaction of drugs, drug transporters and signalling enzymes with lipid membranes; simulation of protein-protein interaction and multi-protein complex enzymatic systems; computational study of signalling pathways; new techniques in computational drug discovery as they apply to enzyme reactivity and dynamics; simulation of allosteric interactions; advances in multi-scale modelling; new techniques for direct simulation of reactivity in biological systems; and the impact of technological advances in computer hardware and software on the field of chemical biology. The conference will feature lectures by established leaders in the fields, as well as encouraging young and talented researchers to present both challenging questions and new ideas for solving them. The aim is to encourage a collegial atmosphere to promote stimulating and insightful discussion while enjoying the beauty of tropical Cairns, Australia. To see a full list of confirmed speakers, click here. Come and meet us at the SOT Annual Meeting Expo in San Diego from March 22–26th (booth #2143)! Email us if you are attending and would like to arrange a meeting. We will have a range of textbooks, books from the Issues in Toxicology Series and other titles on display and for you to browse and purchase at a 30% discount. Rowan Frame, Books Commissioning Editor, and Jen Griffiths, Editorial Development Manager, will be on hand to answer your questions about books, Toxicology Research, and other journals. Toxicology Research have collated some of their hottest papers. These papers are free to access until 31st March – we do hope that you enjoy reading them. Click here to see the collection. The book comprehensively covers the toxicology of manganese. 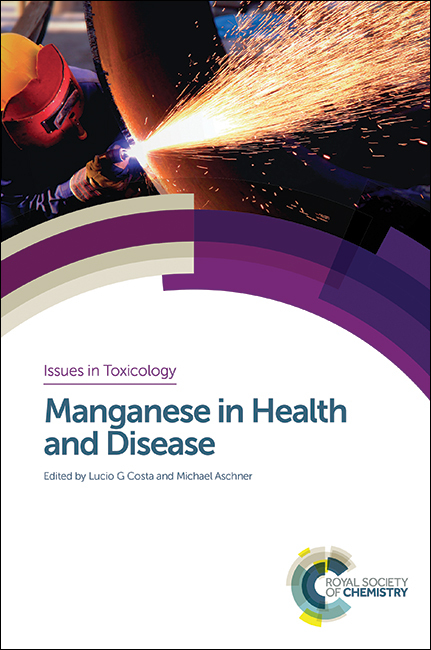 Leading investigators provide perspectives from toxicology, neuroscience, nutrition, molecular biology and risk assessment disciplines and chapters cover the toxicokinetics, toxicodynamic interactions and health effects of manganese, as well as its potential role in neurodegenerative diseases. cardiovascular, infectious, inflammatory and oral diseases in detail. Take 1 minute… and vote now! We challenged early career researchers to explain the importance of chemistry to human health in just 1 minute. The shortlisted videos are now online and we want you to pick your favourite entry. The chemical sciences will be fundamental in helping us meet the healthcare challenges of the future, and we are committed to ensuring that they contribute to their full potential. As part of our work in this area, we invited undergraduate and PhD students, post-docs and early career researchers to produce an original video that demonstrates the importance of chemistry in health. We were looking for imaginative ways of showcasing how chemistry helps us address healthcare challenges and entries could be no more than 1 minute long. Want to get involved? Watch our 6 shortlisted videos and vote for your favourite before 11.59pm (GMT) 17 April 2015!